Hours: Mon.–Fri. 8:30 a.m.–5 p.m., Sat.–Sun. 9 a.m.–3 p.m.
After getting laid off from his biotech job, Sungsoon Park started working in Japanese restaurants and studied at Bauman College, the holistic nutrition school in Berkeley. At Cafe Umami, he draws on those experiences, his Korean heritage, and his love for umami flavors to create a menu that’s uniquely his own. The bulk of the offerings are grain bowls and avocado toasts accented with Japanese and Korean ingredients. 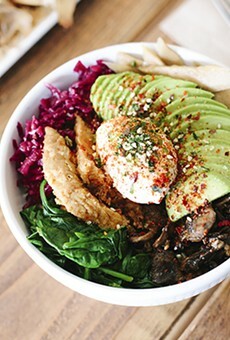 The most basic grain bowl features brown rice, roasted mushrooms, blanched spinach, pickled burdock root, and sauerkraut, along with a creamy ginger-tahini sauce and sprinkling of nori and sesame seeds. Additional toppings include kimchi, seaweed salad, and shaved bonito flakes, all of which can also crown avocado toast boosted with miso butter. Round out your meal with mushroom coffee or a latte flavored with turmeric or miso paste.